VC Rocks Final Blog Hop of the year. Firt Day of School! So sad. Top Three for Sketch 233! One more with the Animal Talk set! 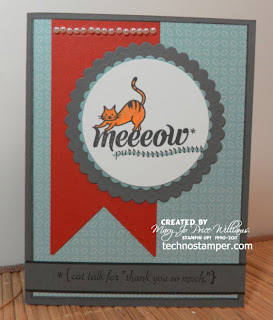 Another sample with the Animal Talk stamp set! LNS is going to the dogs! Top Three for sketch 232! Sorry guys, had a few internet problems and lots of stuff going on, since I am already late on the sketch I am going to wait to post the new sketch next Monday as I am still having some issues with blogger and my internet and I want to spend my last full week with my son before he goes back to school and that consumes our lives again. See ya next Monday! As always thanks for the support and encouragement you all give me. And thanks for stopping by. Isn't this just the sweetest little note holder? I made the little note paper on the MDS and the box was really easy too. If you are a regular follower of my blog you know that I love butterflies so this is perfect for my desk. It was one of the club projects for last month. The girls really enjoyed it. I made them each some sheets of the note paper with their names on them. Fun project. I used the tutorial found HERE. Hope you week is going well, mine has been crazy busy. 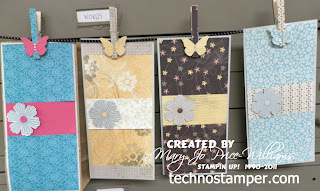 And my samples, both samples are using the Ronald McDonald stamps set Moving Forward.along with the Itty Bitty Banners stamp set. Can you see that I wrote the word welcome on the little banner on the blimp! You may have to click on the image to see. The clouds are from the Soaring Stamp set. 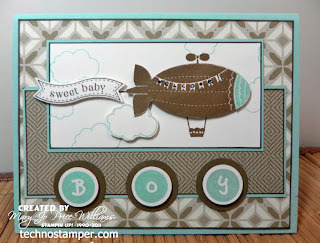 The colors on this first card are Soft Suede and Pool Party along with Whisper White. 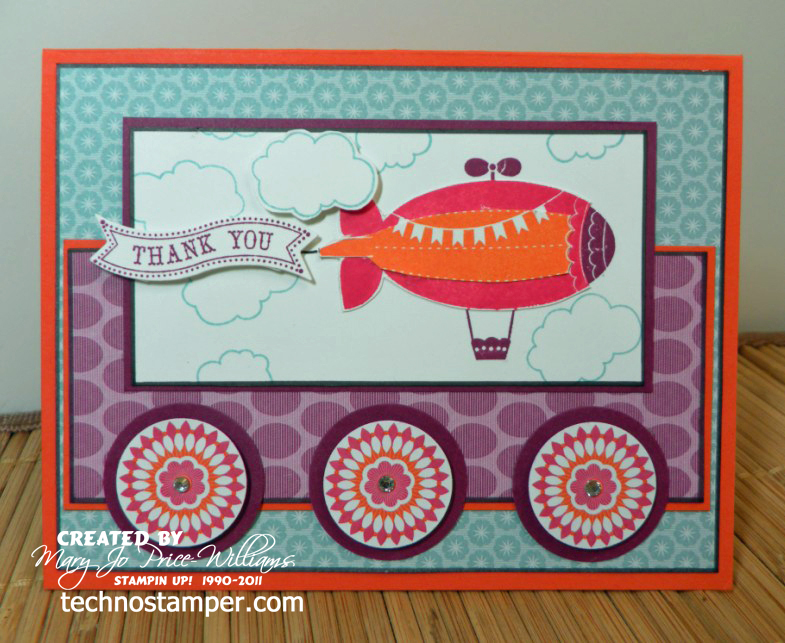 Other supplies used are markers, circle punches, retired alphabits stamp set, bitty banners framelits. 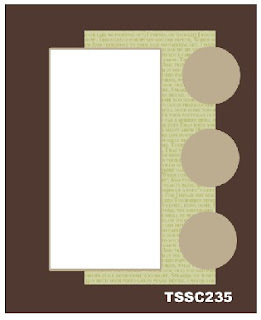 The Designer series paper is from the Comfort Caf'e paper pack. 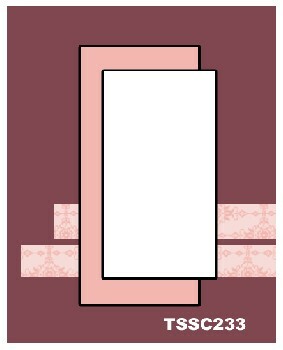 This next card is a bit brighter and girly. 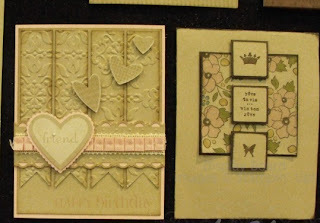 Again the stamp sets are the same along with the layout. 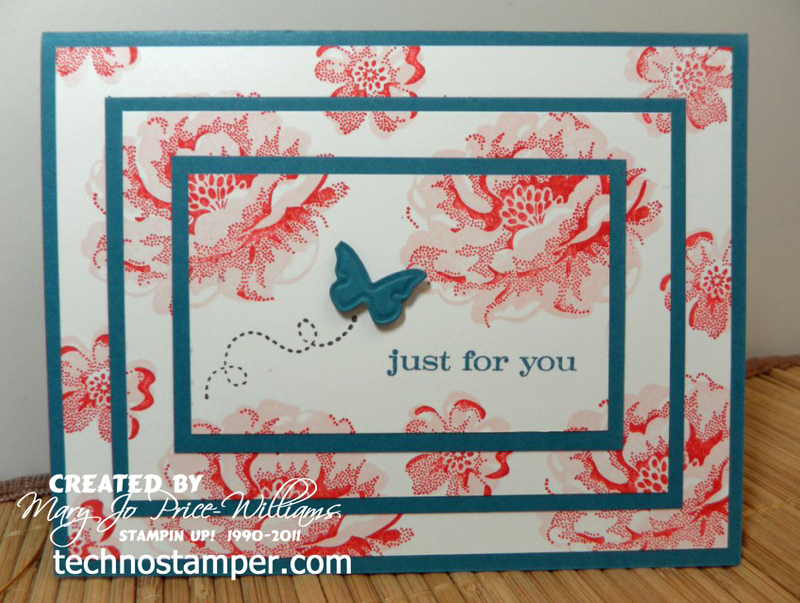 The colors on this card are Baja Breeze, Rich Razzleberry, Tangerine Tango and Rose Red along with Whisper White. 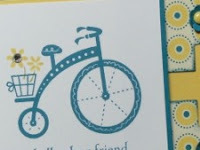 Other products are circle punches, rhinestones, markers and the bitty banners framelits. 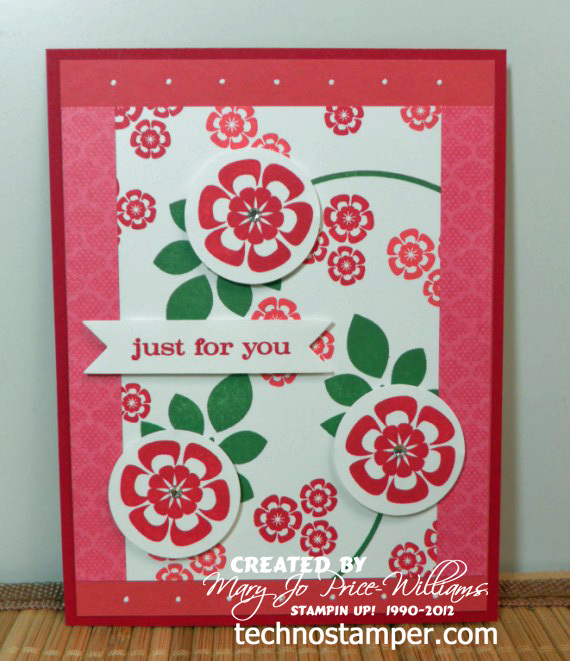 The Designer series paper is from the Floral District paper pack. 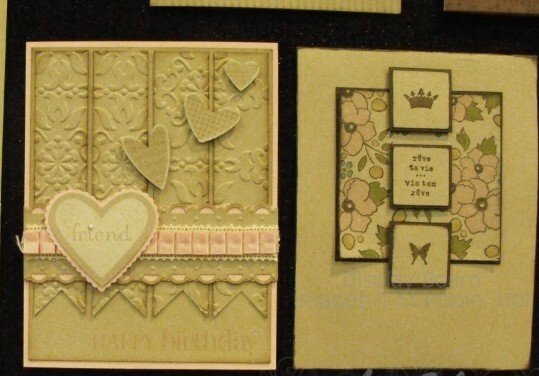 Wasn't that fun to use the same layout, same stamps and get such different looks. Hope you enjoyed it. I also hope you find time to play along with my sketch challenge this week. I think it is a fun way no matter how you flip it!!! 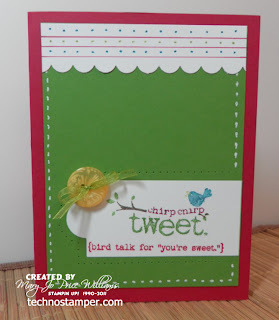 Be sure to come on back and add your link to the blog hop below. And if you add the code to your blog while in the html mode you can allow your readers to play along too right from your blog! Please use a DIRECT link to the project and not just a link to your blog home page. Thanks so much! This was a tough week, each one of the samples were as good as or better than the one before! Thanks for all the awesome inspiration! I did finally pick three to spotlight. 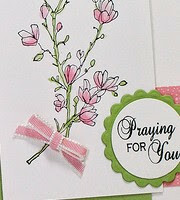 They are in no particular order and as always they are just snippets of the whole card. You can click on any of the images to see the whole card and read the details. And as long as you will be on the creator's blog you should probably leave a comment! 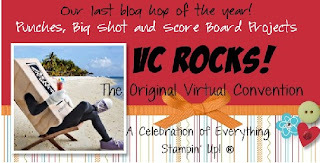 Welcome to the final blog hop of the season for the VC Rocks' crew! Another sad reminder that the summer is almost over--I want a re-do! But although I am sad about my summer coming to a close there is good news too! And that is the fact that there are 19 stops on this blog hop and the crazy talented members of the group are going to be sharing so many creative ideas with you that your head will be spinning! The theme of this hop is Punches-Big Shot and Score Board projects. I believe I used all of those and the MDS too! So I suggest you find a comfy seat and enjoy the hop. If you just came here from Jane's Stamp With Jane blog then you are on the right path but if this is your first stop that is great too, you can just keep right on hopping along until you end up right back here--that way you won't miss anything. And of course if you get lost at any time you can always visit the VC Rocks home page and see the complete list of hoppers along with the links to their blog. So no worries--just enjoy yourself. 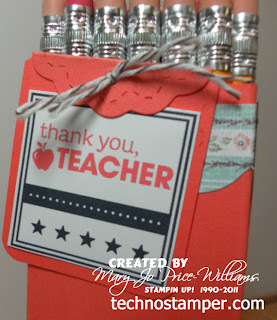 My projects will begin with a few more teacher gifts. That is the challenge on the Latenightstamper's group for the week and it is so appropriate as my son will be going back to school soon and I never send him empty handed! I shared a few projects with you already in the previous post so if you missed those you might want to come on back after the hop and see them. The first project is using the score board, bigshot and the MDS program. 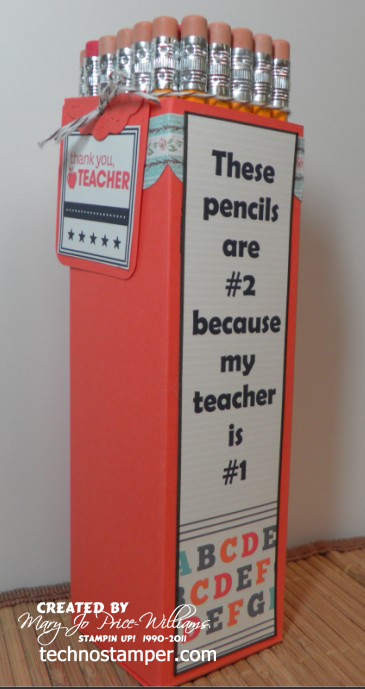 It is a simple 2/4/6/8 box that is full of pencils for my son's teacher. 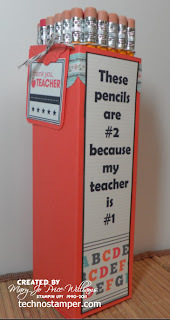 You know that is something that a teacher can never have too many of. 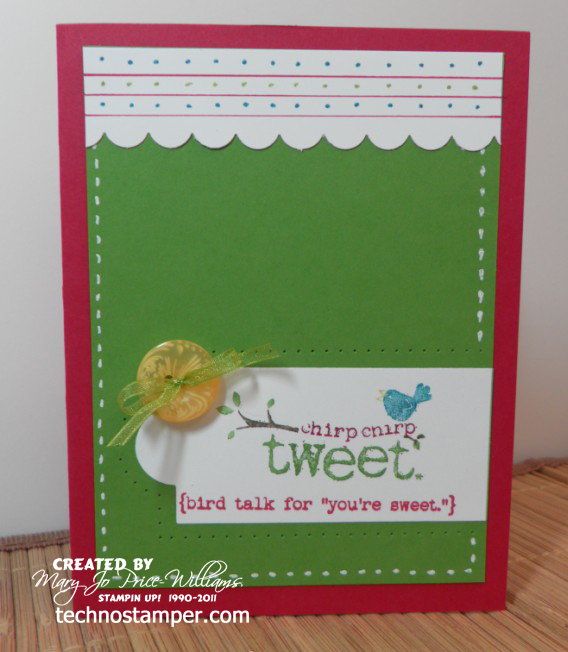 I decorated the box with a scallop cut on my big shot with the Tasteful Trim Bigz Die, then I added a cute saying created on the MDS to the front and finished it off with a tag cut from the Two Tags die. Simple, fast and practical! Score one for me! The next project also using the the score board, bigshot and the MDS program. 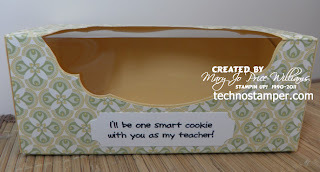 This one needs you to use just a tiny bit of imagination because it is supposed to be filled with homemade cookies but since my son does not go back to school until September 6th I thought I better wait a bit before I baked them, lol! So use your imagination and pretend this cute box is filled with delicious homemade chocolate chip cookies--I can smell them already! 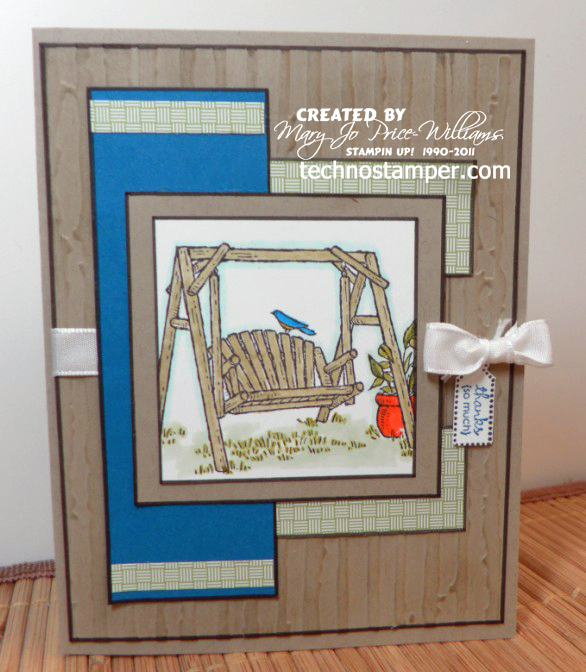 Again it is another simple box but I cut a window in it using the Apothecary Accents Framelits and the big shot. The saying was done on MDS! Again, quick, cute and this time yummy! The final project is a big one for me. Our church is hosting it's second annual women's retreat in September and these will be used there. Again you may need a bit of imagination here--sorry. They are decorated bags with matching decorated clothes pin magnets. Last year we did the sweetest thing throughout the retreat. We took time to write little "love notes" to the other women. Just little notes saying we were glad to meet them, or that we enjoyed spending time with them or that they inspired us or any other little thing you could think of to lift up and encourage our sisters in Christ. The bags that we used to hold the heart shaped pieces of paper with the notes on them kept falling over and it was difficult to find the right bag to put the notes into--each bag has someones name on it. So I thought it would be fun to decorate the bags and hang them on a clothes line with matching decorated clothes pin magnets that the ladies can keep and use after the retreat as a reminder. Hope this makes sense-Here is an individual bag--there will be names on each bag by the flowers. And here a few of them hanging on a "line". I still have a bunch more to make but they fit this theme well since I used punches for the flowers and the big shot for the butterflies on the magnets! Each bag will be the same layout and design they will just use different colors and designs--I am using some of my retired DP that I have way way way too much of, lol! I hope you enjoyed my project for this hop. 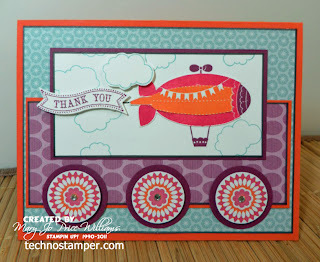 Now you can jump on over to see what the talented Barb Furlong has in store for us on her blog! I am so sad that there are only a few more weeks before the kiddos go back to school. Summer is just so short. 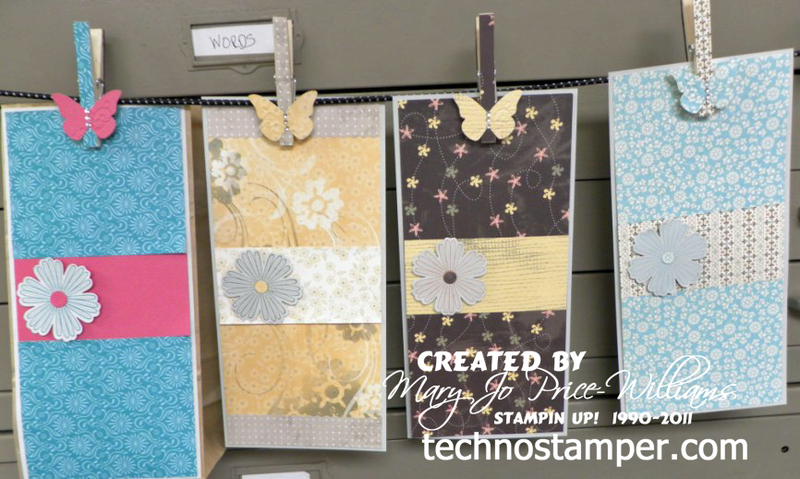 But since it is coming up so fast we decided to focus on Back to School projects this week on the Latenightstamper's group! 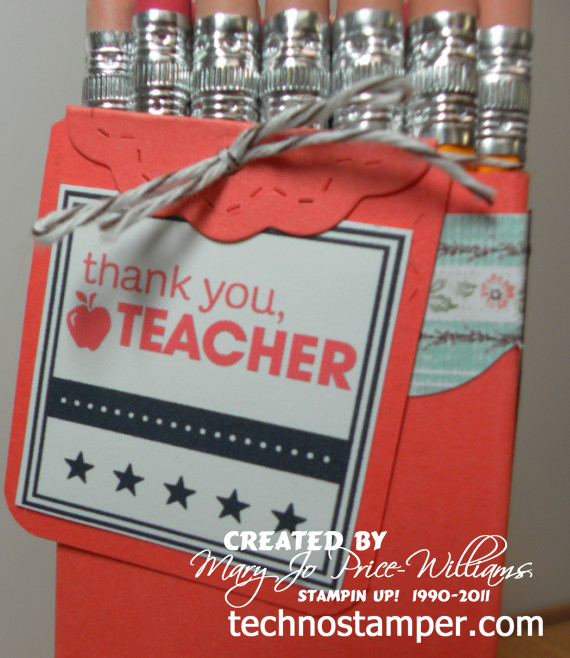 I have so many ideas for little thank you type teacher gifts that I want to make. I know for sure what I am making my son's teacher for first day of school--just haven't been able to get all the supplies together yet so I will have to post it a bit later. 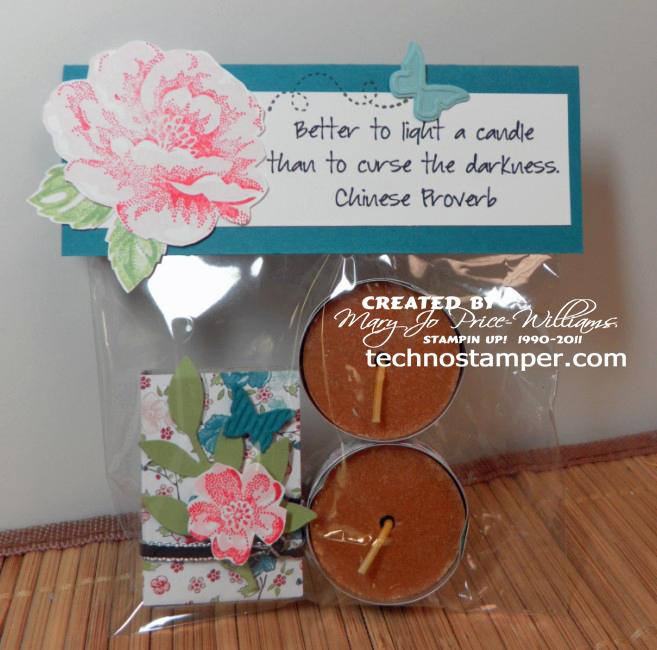 But I did see a darling little idea on Pinterest to package up two tea light candles with a decorated box of matches and thought that would be a super cute little gift for some of the teacher/staff at school so I make one with a matching card. Hope you like it. Actually I hope the recipients like it, lol! It don't seem like it in the picture but the flowers are the same colors. I could not get the candle package and the large flower to both look good because of the glare of the plastic bag. But I am sure you get the idea. These were two of the projects at my clubs this month. 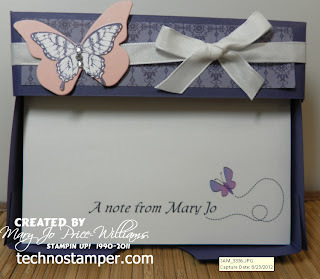 Other: Beautiful Butterflies embosslit, Little Leaves Sizzlit, box matches, tea light candles, clear envelopes, thin ribbon, MDS for sentiment. Check back all week for more gift ideas. And of course my sample to help get the creative juices flowing--I hope! I love this image from the hostess set called Summer Afternoon. Does anyone else forget about these sets now that they are in the back of the catalog?! This is the first time I am using it and I have had it for quite a while. This image is so serene and relaxing to me. I just adore swings and being out side and birds and well, you get the point. So now it is your turn--go forth and create--and remember to come on back and add your sample below. And if you add the code to your blog while in the html mode you can allow your readers to play along too right from your blog! 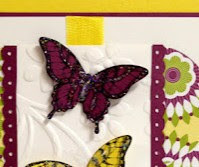 As always these are only little snippets of the cards--please click on each image to see the whole card-and leave a nice comment for the creator! I still have one more card with this darling set. 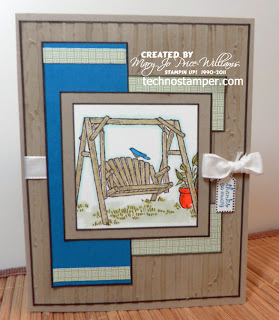 This one is using the bird stamp. Such a cute image. 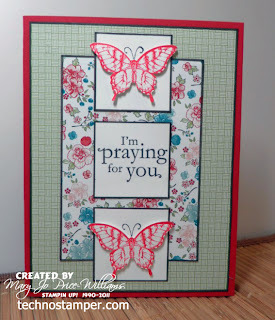 This is a different layout--it just kept evolving it was supposed to be a clean and simple card but I had to keep adding stuff because it looked to plain--go figure! I did get to use lots of fun new stuff though. I hope you enjoyed my set of cards with the Animal talk set. I did not make one with the dog image this time around but I do have one on my blog HERE if you want to check it out. That would conclude the whole set--one card with each image! Time to loose myself in a good book! Here is a quick post for today. 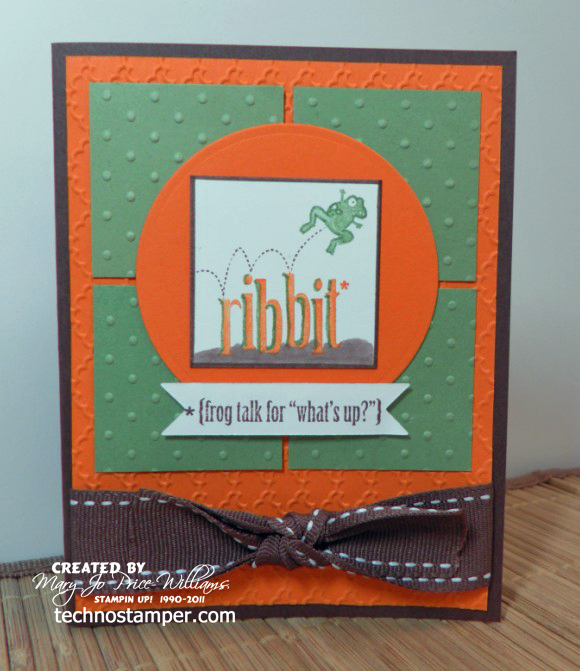 Wanted to share another sample with the Animal Talk set that I showed you yesterday. Such a fun set. Today I am using the cat image. Funny that those pearls didn't look crooked when I look at them in real life--you can always see more details in pictures for some reason. Oh well, I will straighten them before sending it off. This was for a color challenge somewhere???? I can't remember where I seen it so I guess I am not linking up, lol! 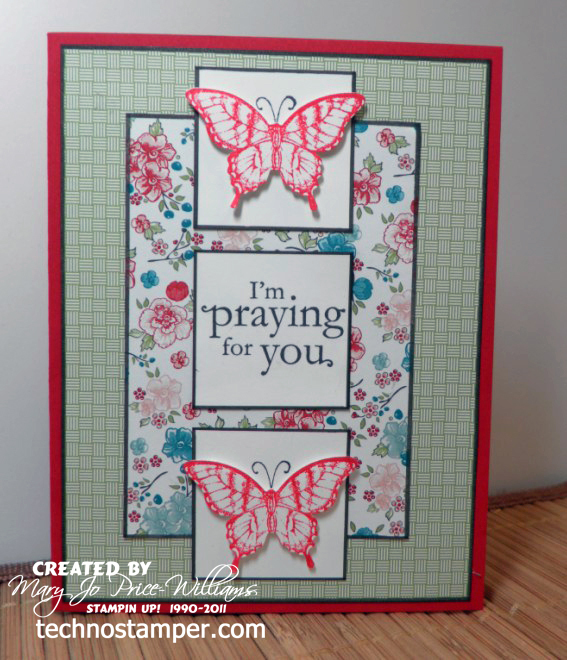 The colors are Cajun Craze, Baja Breeze and Basic Gray with some Whisper White thrown in. You may have to click on the image to see the details. It looks kind of dark to me. I hope your having a fun week and that you are finding lots of time to stamp and enjoy life. I think I am off to take a nice hot bath! Calgon take me away! 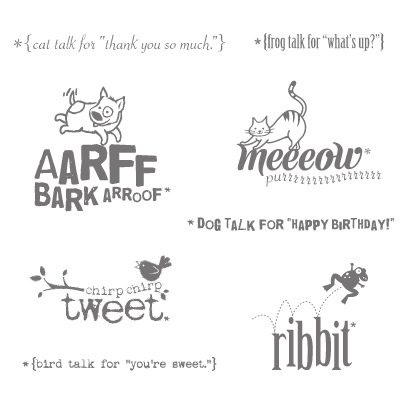 Well actually any animal--our challenge for this week on Latenightstamper's is to use any animal on your project! How fun and easy is that! And I just happen to have the perfect set for a bunch of cards for this challenge. Animal Talk is one of my favorites from the new catalog--so cute! Have you seen it yet? See, I told you they were cute. So I figure I had to make a card with each image. So let's see, today we will start with the frog image. I actually have two with that one but one only uses part of the stamp. But since they are both frogs I thought I would just share both now. 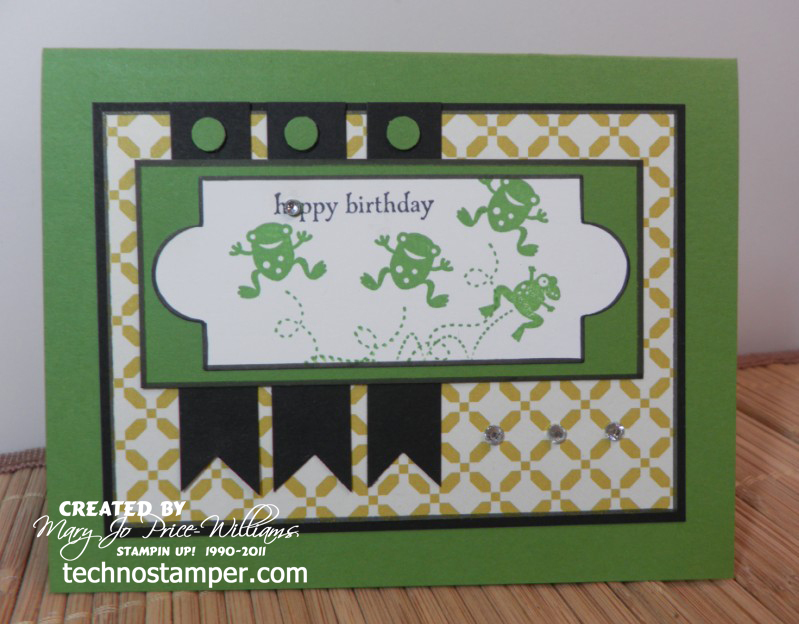 I am not sure why but I always think that frog stamps are so cute! Here are the details for the cards. I just love this fun color combination. Bright and Cherry! Just my style. Now it is your turn! 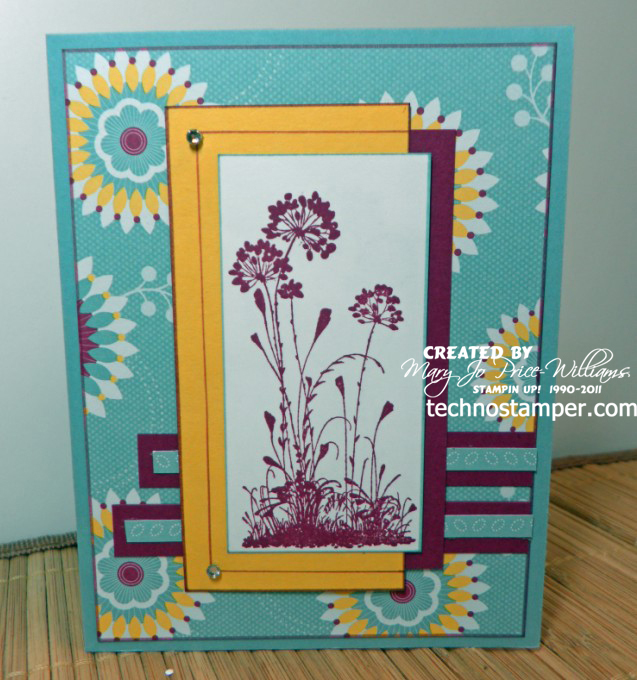 Can't wait to see your creation with this sketch--hurry up and get stamping! Them come on back and add your samples below! Yea, a brand new week! And today is day one of Vacation Bible School! Fun for all! Here are my top three picks from last week players! Thanks so much for playing along everyone. I loved each and every sample. Remember they are in no particular order and you can view the whole card and all the details by clicking on each individual snip-it. 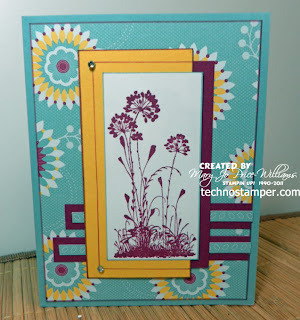 Did you ever notice how some stamp sets are just super easy to work with! Well this is one of them for me. I love this set. It is funny because I have seen so many say they don't like this set, but I think it is so fun and easy to work with. I do agree that at times it is hard to use the bird--I think he needs legs because I don't think he looks like he is flying but he don't look like he is resting either????? Somewhere in between and I do find that hard to work with. 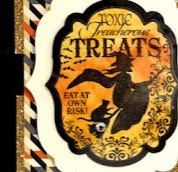 Here is what the set looks like..
Have a great day today--I am cleaning my craft room and re-organizing some stuff--YUCK--I just want to craft not clean my craft stuff! obviously the card on the right, lol! I love the other card too! May have to case that one too! Here are the details for my card. 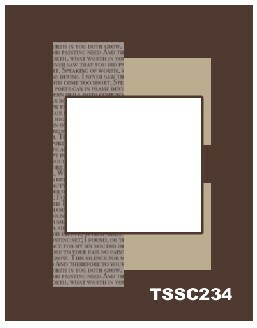 I have really been enjoying the simpler cards lately--funny how our taste changes over time--back and forth!